Neither all sports nor all dances are created equal. Of course, any physical activity is a great way to become more aware of your body – at the same time as more awareness helps you to improve. But does one need as much awareness to run or to do yoga? To play volley ball or to learn aikido? For me, among all sports and dances I tried in my life, and I tried many, tango is the thing that took me to realize that I had a super power inside my brain. And not only I did not work to improve it, I barely knew it was there: awareness. To say the truth about my story, I did the road in reverse gear. Many times I heard during tango classes: you have to dance through the body of the woman, you have to feel everything she does, to feel how she moves. First, it sounded weird. Then, I believed there was something to this. I started to like the idea, to feel some improvement, and many years passed before I realised that I would become a way better leader if I would explore my own kingdom before going for someone else’s. It was the real beginning of my tango road. Our kingdoms are our bodies. Argentine tango offers a fantastic tool for their exploration: a wide range of simple and natural moves, often done slowly. Moves that implie physical difficulties are not so good for awareness. To achieve them, one needs strength, or speed, or streching, that distract from the quality of their realisation. Many sports I love, or fast dances, keep us struggling to reach some aims. The effort does not leave place to observe the process. At the opposite, take for example the tango walk. Who would have suspected there are so many ways of walking? And one can improve so much in such an „easy“ action! Then, change any little detail of your move – maybe you would hardly feel the difference when walking in the street – and look how you feel on the dance floor! Your interpretation of the music, the way you connect to your partner…. It is like you just discovered a bright new dance! And above all, Argentine Tango embrace, and its precise and subtile language that allows to lead and follow, make for a very special connexion beetwen the partners. Some way to extend your own awareness to a second body. From this point of view, tango shares a lot with martial art. Well, instead of the pleasure of throwing your partner on the floor while breaking his arm, you only share with him or her the emotion of interpreting some music with your bodies… Nothing is perfect. Awareness and movement? No surprise, my tango road lead me to the Feldenkrais Method. 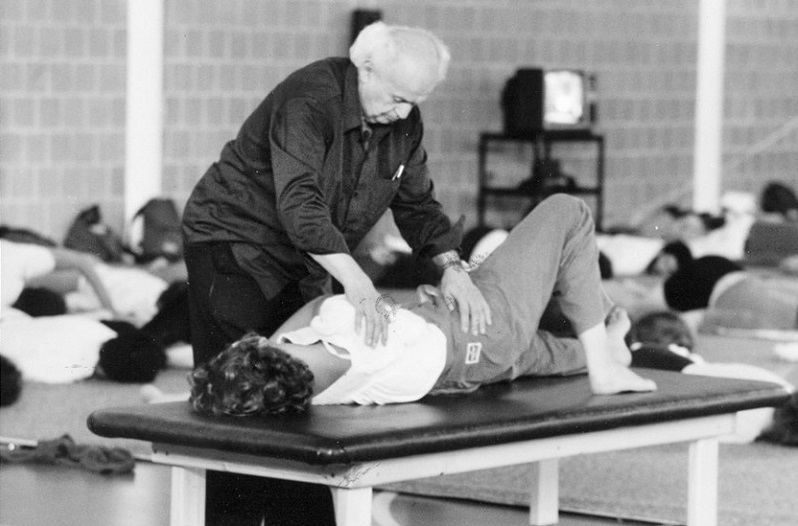 I am now studying in the 4 years training (Barcelona Internationnal II) to become a certified Feldenkrais Practionner, and I am widely using tools from this method in my teaching of tango. My respect and my admiration for tango took me to spend many years and a lot of energy to learn from the best, to live in Buenos Aires, and I am grateful that 9 years ago, I could start to make a living from teaching tango, because this way I could go on learning and deepen in my passion full time. I am still learning now. The most valuable gift I can share with my students is the understanding of how rich and deep and passionating is Argentine Tango. I undertook my Feldenkrais studies with the same respect for this method aimed at developing our awareness, and I hope to share and widespread its fantastic potential for tango and not only.